Autumn is our favourite time of year -- harvest is underway in the vineyards, the crushpad is bustling with freshly picked grapes, and there's the sweet smell of fermentation in the air. With the mild, sunny weather, it's a perfect time for wine touring in the Okanagan and Fraser Valleys and enjoying a plethora of great events at both our south Langley and Naramata Bench wineries. In south Langley on Sunday September 23, Township 7 is a popular stop at the annual Campbell Valley Wine run. Participants run a 15k route though the Campbell Valley Park and stop at wineries enjoying tastings. Support this fun and healthy fundraiser for the Pacific Riding for Developing Abilities charity, which provides therapeutic riding for youth and adults with disabilities. Want to learn how to taste wine like a professional? Join us this fall at the Okanagan Wine Festival for an entertaining and tasty sensory wine seminar. On September 29 and October 6 at our Naramata Bench winery discover the 7 sensations of wine and the tricks for detecting acidity, alcohol, body, tanning, sweetness, and how oak and time can influence wine. Later next month, get ready to kick off your shoes, roll up your pants and crush some grapes! 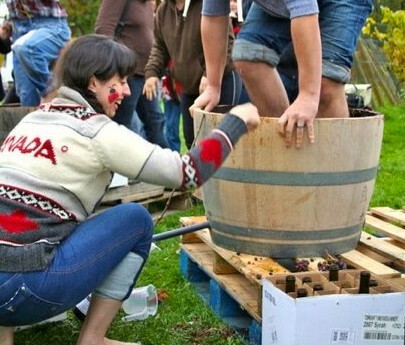 We're holding our 8th annual grape stomp at our south Langley winery. We are accepting a limited number of teams to #getstomped in this friendly competition. Prizes will be awarded for "Top Stomp", "Best Costume" and many more! Check out the Vancouver Sun write up on this fun and quintessential wine country experience. More information on all the events is on our website. We hope to see you there!